Can Occupy survive its representation? Can the Occupy movement survive its representation? This was one of the questions asked of us during the McGill Occupy workshop. The question essentially sought to open a discussion around Slavoj Žižek’s speech at Occupy Wall Street warned activists not to fall in love with themselves (which was also published as a Guardian Comment Is Free article). When the question was posed, it was also noted that “Occupy” had already started to crop up as a brand for things that have very little to do with the goals or practices of the movement. It was also suggested that at public gatherings activists spend more time talking about the Occupations than talking about (or acting upon) the structural inequality of wealth and power the movement has called to our attention. Thus, with the attention Occupy has been given, the discussion it has sprouted and the branded items it has produced, can the Occupy movement survive its representation? This question is an important one but immediately raises the question, representation by whom? It also opens up pathways to examine the mainstream media representation of Occupy (and its limits) and, perhaps more important, the output by citizen and community journalists and Occupy members. Also when considering if the Occupy movement can survive its own representation, we need to consider the constant commodification of dissent. To emphasize this point, we can turn our attention briefly to the topic of hotdogs and sausages. At present there is a television ad doing the rounds by Maple Leaf Foods which uses the guitar riff from Buffalo Springfield’s ‘For What It’s Worth’ (which some people may know as ‘There’s something Happening Here’). While not written originally as a protest song against the Vietnam War, it became one of the key protest songs of the anti-war movement; and now it is used to sell bloody sausages! The point is, the commodification of dissent is something that has plagued consumer capitalism for some time. It is also challenge the Occupy movement continues faces. For example, rapper Jay-Z, who sits at the Top of Hip Hop’s rich list, making over 37 Million Dollars in 2011, designed and sold a t-shirt through his clothing line which said “Occupy All Streets”. Not a penny of the t-shirt sales went back to the movement. This was nothing more than an opportunistic money grab. Jay-Z’s selfish act stands in stark contrast to Sheppard Fairey who donated the proceeds from his Occupy Protester Image back to the Occupy movement. Of course there are also more grounded and admirable initiatives such as Occuprint which collects, prints and distributes posters from the worldwide Occupy movement and feeds its funds back into the movement. Part of the reason there have been so many Occupy-branded trinkets for sale is that we are unable to experience events in our society without consumption. Watching the Super Bowl requires buy the Super Bowl nachos and beer and emulating the parties we are expected to have using the products advertised to us. 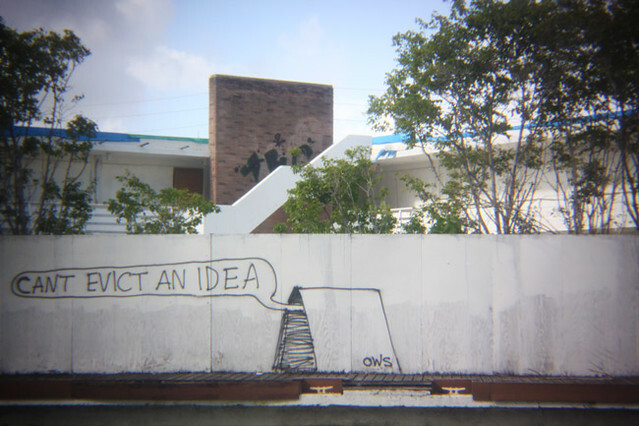 Thus, in terms of Occupy surviving its own reputation, and in the spirit of Zizek’s comments, perhaps the best thing that could have happened to Occupy was to be forcibly uprooted. The Occupy movement was never about occupying a lawn or a sidewalk, but about occupying an idea. An idea which is dangerous. An idea which can be lost in the daily struggles of trying to keep a camp running. The evictions, including this weekend’s eviction of Occupy London have galvanized occupiers, provided a narrative and banner to organize under and bought time, to rescue its representation. Thus, Occupy can survive its representation and the evictions will help it do this. 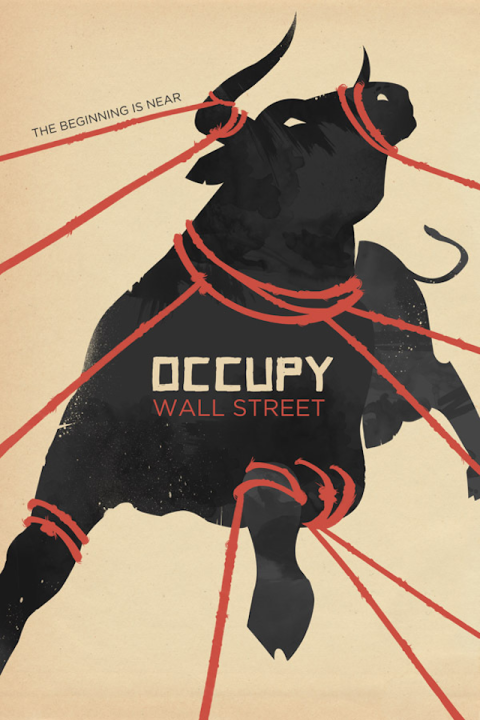 The Occupy movement is already occupying peoples’ minds; it has started a public conversation. While winter, and not to mention the authorities, have pushed it Occupy into a cocoon, it certainly appears capable of undergoing an incredible transformation in the spring and realizing its potential as one of the most important social and cultural movements in the last 50 years. This entry was posted in occupy, protest camps, social media and tagged media frames, occupy canada, occupy wall st. Bookmark the permalink. 2 Responses to Can Occupy survive its representation? The conversations have been brought to the table. Can it survive its representations? That’s a tough one. The best thought is to take the cobrandings and bring it back – ask JayZ what he knows, understands, and has learned about the Occupation. Write the songs and fuel the messages given. Sure, there’s a dozen groups latching in – some for good, some for less good purposes. Repeating the observations in something of an open education setting might [maybe] keep the conversations flowing. So elements are taken. Fair enough. Take ’em back. You hear, “For What It’s Worth” playing to sell sausages – so the tune is on the forefront of their thoughts. Sing it, then snark back that you didn’t think, “Stop, children, what’s that sound -ev’rybody looks what’s goin’ down…” was ever intended to peddle meat food products? Ah, YouTube…perhaps one of our intrepid videographers can splice in a Pink Floyd reference into a montage, who knows? It’d take the music back, I’m sure – and I’m pretty sure that Roger Waters would chuckle at the change, might even adapt/adopt the update, who knows? What I’m saying is we’re an intelligent, creative bunch – use it. Fuel it. “We can survive the faces if we keep our message out in the places, take up room in all the spaces, show our passion in our faces. ” – I don’t know if that is someone else’s quote or if it’s something I myself wrote ages ago but if that’s what we got, it’s what we got. The Countdown show on CurrentTV challenged the stations to open dialogue about the Movement. It wouldn’t have happened without someone, somewhere, taking that spark and lighting a few campfires with it. So shed a light where you can. I’ll keep torches by the door.